Check pricing on different materials and use popular materials. Harder materials (e.g. steel and stainless steel) are usually more expensive than softer materials (e.g. aluminum, plastic, etc.). For high quantities consider splitting a job to two orders – a small run with faster delivery and the main run with slower delivery. Use 2D parts made from sheet material instead of 3D parts made from block material. Stack 2D parts or bend to make 3D shapes. Instead of machining text use silk screening or labeling. Make parts multi-functional to reduce part types. Increase quantity to reduce cost per part. Use the loosest applicable tolerance. Use common and simple finishes. Avoid multiple finishes. Use a material that does not require an extra finish process. Create multiple parts as one object and specify to saw apart as a secondary process. Convert single complex parts into multiple simpler parts that are fit together. For example, to create a large disk with a thin rod protruding from the center you can use piece or design the disk and rod separately. To do it in one piece requires starting with a large block of material and might therefore use ten times as much material as making the rod and disk separately. Tap holes no deeper than three times the diameter when the hole and bolt are the same material (deeper usually adds no strength and can substantially increase cost). If you have several parts to order with very minimal difference it may be more economical to submit one drawing with annotations (e.g. “Omit hole B on half of the run”). Make shapes simpler or smaller. Design shapes that don’t waste material. For example, a large U shaped part might be more efficient in three separate sections to avoid wasting the material in the center. Avoid sharp inside and outside corners. Increase the radius of inside and outside corners. For 3D parts minimize the number of different hole diameters. Avoid fine details in shapes. Avoid shapes with long protrusions, thin shapes, shapes with lots of material removed, etc. Avoid the need for complex work-holding. Rectangular parts are the most practical. Round parts requiring milling are a little more difficult. Shapes with complex outer shapes are the most time consuming to setup for holding. Make narrow slots and channels wider – narrow areas require small cutting tools which work slowly. Avoid adding explicit chamfers or rounding to edges in a CAD design as edges are normally broken by more economical methods. Inside deep pockets, for any protrusions close to walls (e.g mounting posts) join the protrusion to the wall so it’s not a separate “island”. For parts cut from sheet material, get several different part shapes out of the same sheet. For holes that are close to an outside or inside edge, some processes will be more efficient by merging the hole with the edge into one contour, so as to reduce the number of times the material must be pierced. Design bent parts to pack efficiently. For example, in designing a large box consider making the sides of the box separate with bolted flanges. Packing efficiency is more important with larger parts. Parts with one bend generally pack much better than parts with two bends. Bends with angles greater than 90 may pack better than those with 90 degree bends. Sometimes complex bends are more economical and easier to fabricate if you design two simpler parts that bolt together. IMPORTANT: Also see cost reduction tips that apply specifically to eMachineShop. In custom manufacturing – whether for machined parts from eMachineShop, printed brochures from a printer or stuffed teddy bears, setup costs are often the main factor in the price when ordering just one or a few parts. This is why custom manufacturing costs more than off-the-shelf products. For example if you design a threaded bolt and want to order one or a few pieces don’t expect to pay what you would pay for a stock item at a hardware store. The reason is that a custom manufacturer has to go through several steps whether you order one or many parts. For example, even for quantity one of a simple part here are some the steps eMachineShop might go thru for an order: review the order; locate material in stock or order material; program the machine; setup cutting tools; setup a way to hold material during cutting; test run the program; run the parts; perform initial inspection; debur the edges; clean the parts; perform final inspection; pack and ship and log the shipment on the database. 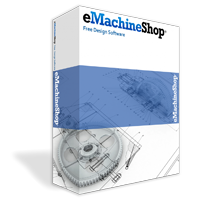 Nevertheless, eMachineShop strives to keep setup costs as low as practical and is usually competitive compared to other custom manufacturers even at quantity one. A threaded bolt from a hardware store that costs $1 will cost far more when custom manufactured at low quantity. This is because most parts sold in stores are made in large quantities which spreads the setup and tooling costs over the large quantity. And parts sold in stores are often made using a process different from what is used for small quantity custom runs. For example, a 6″ copper pipe that costs $5 in a store is likely made by extrusion, whereas a custom pipe made in low quantity more likely would be machined. Machining is less expensive than extrusion at low quantity. Similarly, many retail parts are made by injection molding which is also more economical than machining but only at large quantities. Parts that are machined at low quantity are usually made from a solid block of material. So, even if the amount of material in the finished part is minimal, much material is used in the process. Both the cost of the block of material and the time to remove the unused material add to the cost. Do I pay for setup on reorders? It depends on the type of job. For example, the tooling for an injection molding job is paid for only on the first order. But for a process that does not require hard tooling, the machine has to be setup again for a reorder although the setup cost is relatively low. The price given by the software automatically accounts for this.